My cyclingling has been in havoc for the past 4 months. My office relocated from WV to PA (4 hrs away) and my family is still in the transition process. So my training and racing has taken a major hit. In the last month I've finally had a chance to get in some miles and damn have I lost some fitness. So.... the weekly series here in Pittsburgh at the Washington Blvd Oval by ACA started a couple of weeks ago. I made a trip downtown on opening night (raining and cold) to watch the A's and B's. It looked pretty cool. It is a 1/2 mile oval. There is a slight hump at the start finish line otherwise it is a very slight down grade on the back stretch and very slight up grade on the front stretch. It is an old driving training course. They run weekly racing April till September, the C's & Women on Tuesday's and A's & B's on Wednesday's. I'm nowhere close to race fitness but I figured what better way to train than to suffer. So I decide to give the C race a shot and just hope not to get dropped. The weather was great, it was finally sunny and somewhat warm. They run though a clinic prior to the Tuesday races. They cover pacelining and misc race information for newbies. They ran the women/junior race then we were up. My plan was to hang toward the back and gauge my fitness. We were doing 30 laps. Well long story short I didn't get dropped. 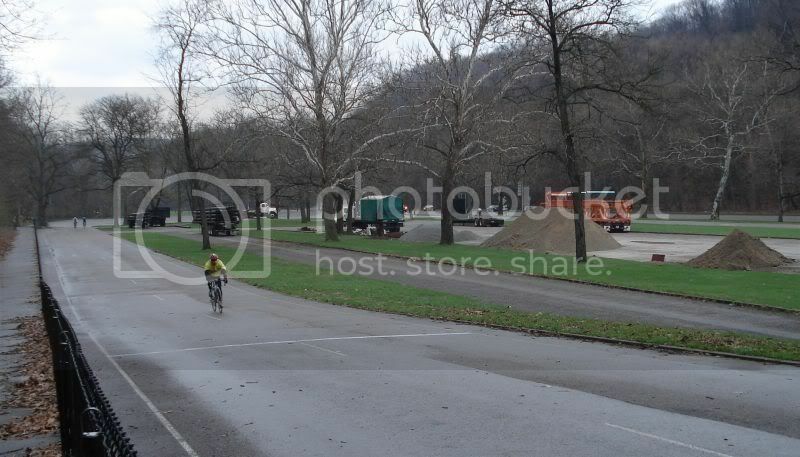 On the last lap I moved up into decent position on the back stretch. In the last corner some dude in front of me just sat up and I had to hit my brakes. I got back into my sprint and passed a handful of guys to come in 15th out of 33. With my leve of fitness I was satisfied with the result. We'll give it a whirl again this week. I may even be dumb enough to give the B's a shot on Wednesday. Last edited by PolishPostal; 04-30-07 at 08:01 PM. Welcome back to the game! I've been wondering what became of you. Good luck in your new city. Last edited by sverrefehn; 05-01-07 at 12:16 PM. Thanks. I miss the OVR series. I think I'll hit the Team Columbus crit in St. Albans WV on June 2. Having to move to Pittsburgh as a Mountaineer could be emotionally devestating. I saw some dude at the Palmer RR with a PolishPostal jersey on....I actually thought of you at that moment LOL. It wasn't me but since you mentioned that I think I'll wear it tonight to the Oval. Welcome to the Oval. Last week was a good race. Hopefully tonight will be more of the same (assuming the rain holds out). Look for me: I'll be the tall guy in the pink jersey. Kevan, How are you? Your former compatriots at Campus Cyclery have been riding strong this spring. Tracy has been a monster. I hope your racing is going well. PP, the pink jersey is for real - do not underestimate it! Tell me about it. Kevan put a hurting on us all tonight. But I'll give him some time to tell the story.